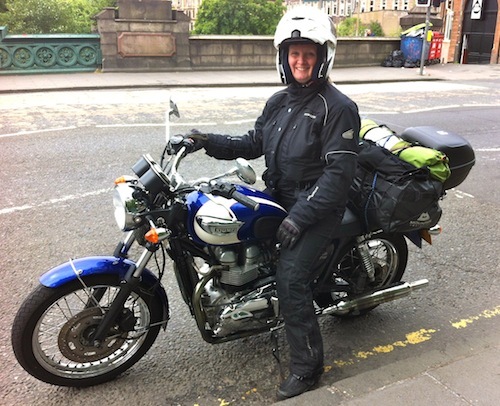 A rollicking ride around Australia with motorcyclist Jill Maden. I’ll remember the summer of 2013 as one of the more hectic in my adult life. Not only have I been busy talking about my new book, The Shadow Lantern, to audiences from Inverness to Yorkshire, but I moved to a new home and studio. With so much going on, reading became a fantastic escape from the giant list of things I had to do. If I had to choose my ultimate grown-up ‘escape’ book of this summer, it was my friend Jill Maden’s Excess Baggage, because it transported me all the way to the back roads of Australia. I know very little about motorbiking and not much about Australia’s geography. I’ve ridden nervously on the back of a couple of bikes in Asia, but wouldn’t dare learn to ride one. Jill, on the other hand, knows how to fly a plane and ride a motorbike. This makes her extremely cool already, and when she told me she was publishing the story of her 2011 trip across Australia on her bike, I expected tales of derring-do. Excess Baggage features tales of Jill’s races against extreme weather, late night arrivals in small town hostels, friendship and loneliness, and – above all – her entertaining struggles with a mountain of excess baggage. She writes in a humorous and, at times, self-deprecating way which kept her story moving along enjoyably – and I say this not just because I know Jill. I would have liked this book if I had not known her at all. Jill has been raising money for charity by doing rides around Scotland and blogging about it on her website. If motorbike adventures interest you, check it out.